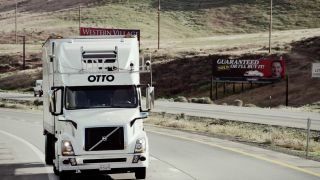 A group of ex-Google, Apple and Tesla employees have launched a startup called Otto to bring autonomous driving to big rig trucks. The company aims to bring its autonomous driving technology to market for "a fraction" of the cost of a new tractor trailer, which typically costs around $100,000 to $300,000. Although the company was only founded in January of this year, it's already begun testing in California and Nevada. "Trucks are unsexy, and that's why we're doing it," said Otto co-founder Lior Ron speaking with Backchannel. "Because of federal regulations, a truck can only drive 11 hours a day today with a single driver. After 10 hours, the accident rate goes exponentially higher. If we can make it drive safely 24/7, more than doubling its capacity and utilization, that's a very strong financial argument." There are an estimated 4.3 million big rigs on American roads today driving millions of miles a year delivering 70% of the things we buy, according to Otto. Otto's autonomous tech will only work on highways, which helps simplify the technology since they don't have to worry about pedestrians, traffic lights and bicyclists. The biggest challenge for autonomous trucks is getting its sensors to see far enough ahead since highway speeds are much higher. "We're optimizing for this kind of driving, with sensors mounted up on the cabin for a much higher vantage point," said Ron. It's still very early days for Otto's self-driving technology, but the company imagines it will get to a point where a trucker can sleep while his or her truck plows on through the night. There will still be a need for truckers to navigate city streets, but being able to drive long distances around the clock will make trucking much more efficient. Otto will face many of the challenges that Google faces with bringing its self-driving technology to market. Both companies face government regulations from each state and they'll have to convince regulators that the technology is safe for both drivers and others on the road. Other automakers like Daimler are also testing self-driving trucks, and it'll be a race to see who launches first.